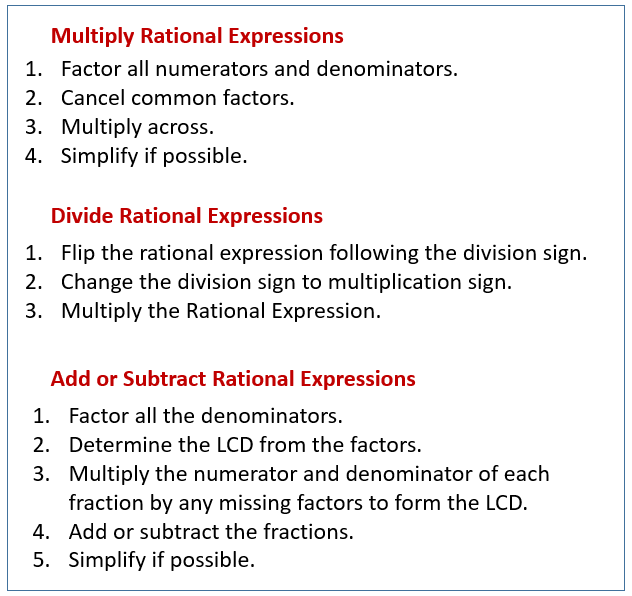 The following diagrams give the steps to multiply, divide, add, and subtract Rational Expressions. Scroll down the page for examples and solutions. Multiplying rational expressions is basically two simplifying problems put together. When multiplying rationals, factor both numerators and denominators and identify equivalents of one to cancel. Dividing rational expressions is the same as multiplying with one additional step: we take the reciprocal of the second fraction and change the division to multiplication. How to multiply and divide rational expressions. Examples on how to multiply rational expressions when the numerators and denominators are monomials. Examples on how to multiply rational expressions. Examples on how to divide rational expressions. How to add and subtract rational expression with and without like denominators. Examples of how to add and subtraction rational expressions with the the same denominators. Examples of how to add and subtraction rational expressions when the denominators are different.